Arriving at the street corner that marks the entrance to the Montreal borough of Verdun, you can’t miss the black-and-white set of blocks anchoring the intersection. With its dark streetside façade jutting out at different vertical planes, it stands in stark contrast to the surrounding brick duplexes and triplexes that define the area. And that’s exactly the point. Designed by the young architecture firm Kanva, Elää isn’t just the new kid on the block. It’s an entirely new kind of place for living. 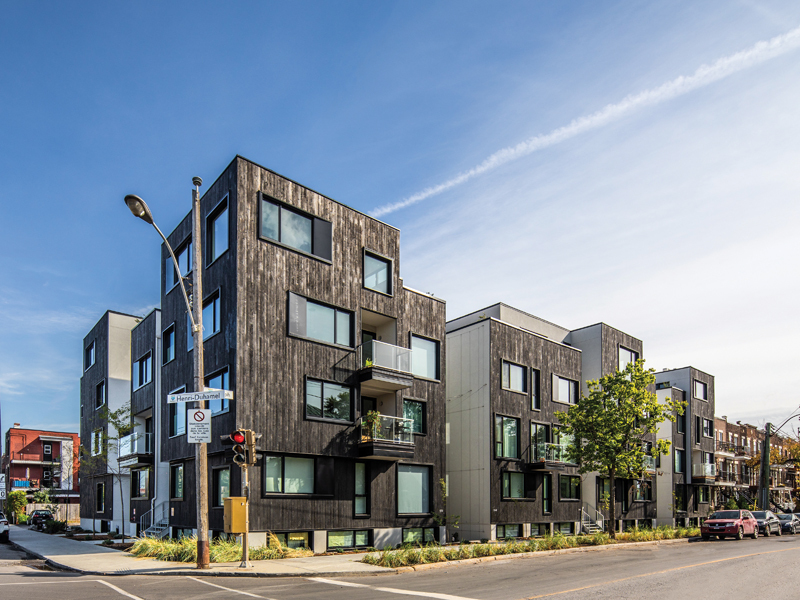 A Scandinavian-inspired aesthetic distinguishes the multi-unit Elää from neighbouring triplexes in the Montreal borough of Verdun. “We wanted to create a new typology—a village,” says architect Dina Safonova of Kanva. She explains that the borough has many pockets of green space and swaths of nature. The citizens favour some degree of communal living, making ample use of the area’s parks, trails and marina. “Verdun sits between the St. Lawrence River and the historic Lachine Canal, so people are always close to nature and water, and they like to get outside,” Safonova says. The design for Elää takes these broader community elements and makes them central to its overarching theme. 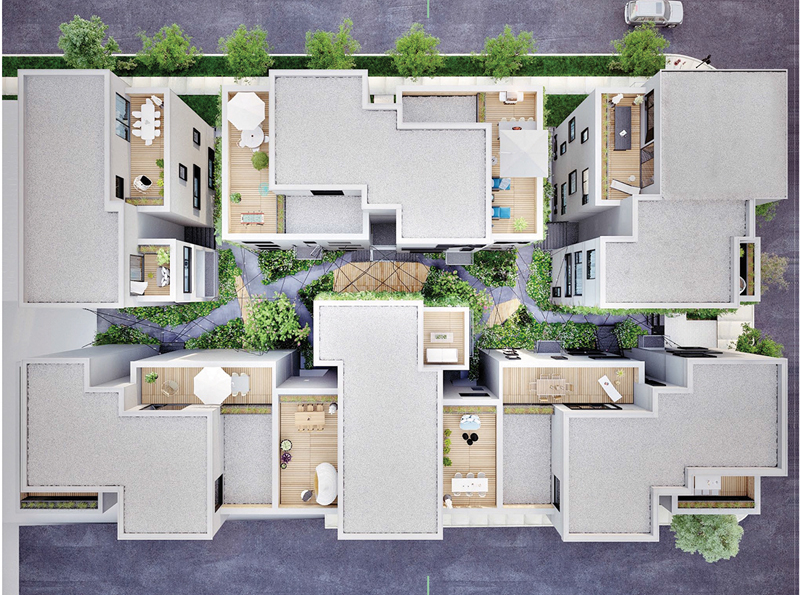 Composed of six separate building blocks, which all together house 41 condos, the complex is conceived as a village. At the centre of this village is a green space that, much like a town square, serves as connective tissue, uniting the six volumes as well as the residents who live within. This slender landscaped courtyard is crisscrossed by a path that leads to the main entries of each block, allowing for face-to-face meetings with neighbours as they come and go on their daily business. Kitted out with benches and a barbecue area, it also brings people together in the summer. “It’s like the green spaces that dot the borough beyond,” says Safonova. Weather- and fire-proof charred cedar on the street-facing surfaces contrasts with white acrylic panels adjacent the courtyard. The norm in Montreal has historically been to construct buildings with a defined front and back. Triplexes dating from the 1900s, for instance, reach from the street in the front to a laneway or a yard in the back, creating a long and narrow floorplate for the dwellings inside. For Elää, the approach was completely different. “Here, there is no front and back; instead, there’s inside and out,” says Safonova. 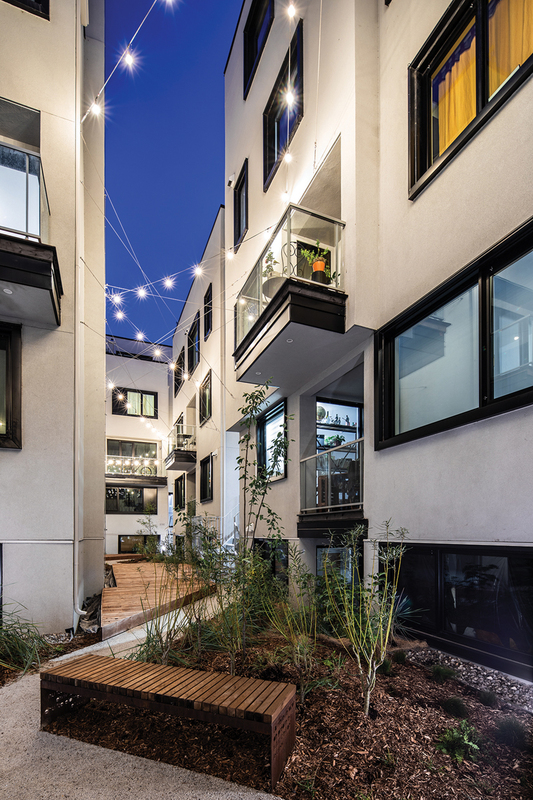 The courtyard configuration—inspired by Scandinavian design, a fact that was used successfully by the developer in its marketing—and ample fenestration in multiple directions in each unit give residents greater access to daylight and a range of visual connections to their surroundings. You wouldn’t see this in older buildings just around the corner, or even in many of the brand-new condos along the Lachine Canal, which still follow a version of the “same-old” recipes. A rendering of the interior of one of the units, whose layouts were planned to allow for views in multiple directions. To ensure privacy in a complex where the different blocks are close to one another, no unit looks directly into another, with windows set at different heights and slightly offset from those of the next building over. 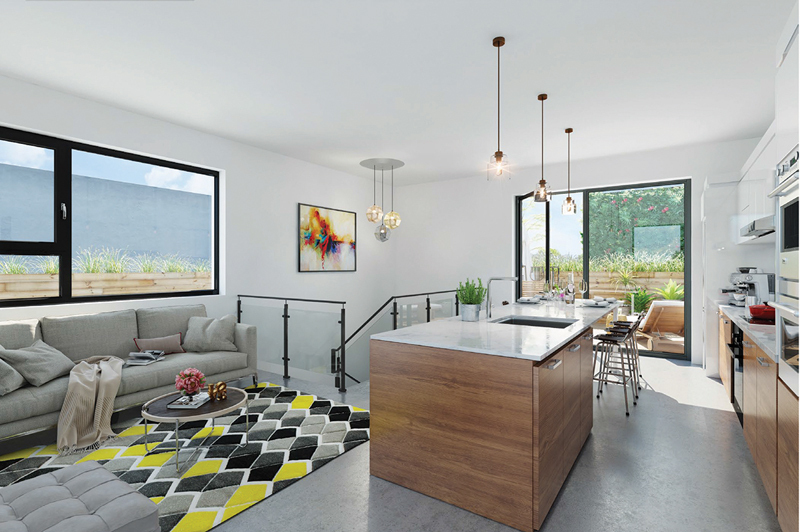 Still, all occupants have views of the common garden as well as of the surrounding streets; units set slightly below grade have a small walk-out patio, while top-floor dwellings have a rooftop deck. A canopy of lights hovers above the landscaped area, and many of the courtyard walls—kept light in colour to contrast with the dark cladding toward the street and to create an open, airy feel—will eventually become living walls covered in vines climbing up wires from the ground all the way to the rooftop, further enhancing the sense of nature. The courtyard weaves between the units and includes landscaped beds, benches, a communal picnic area, and overhead lights. Connecting the street and the courtyard, two roofed bicycle storage racks have secure space for one bike per condo. Compare that to only a total of ten underground parking spots for cars, much less than the borough first asked for (and one of many project-specific deviations from existing by-laws), to boost the use of active and public transit. The bike storage modules riff off Montreal’s traditional entrée-cochères, which once served as the entries for horse-drawn carriages from the street into courtyard stables. At Elää, the bicycle entryways also serve to enhance the project’s porosity, funnelling light and breezes into the communal area. The encouragement of low- and zero-carbon transportation, along with the use of exclusively native, drought-resistant plants; recyclable building materials; high-performance insulation; energy-efficient appliances; and hook-ups for solar panels that make the building net-zero-ready have garnered the project a LEED Platinum rating. On a material level, Safonova says, the inside-outside theme and private-public separation are underscored by encasing the perimeter in dark cladding while leaving the courtyard façades bright. 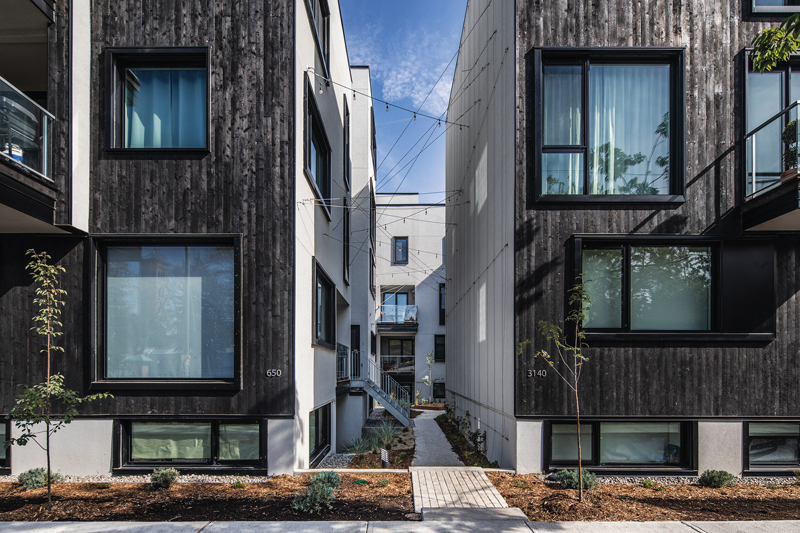 Toward the street, the architects chose local cedar that was charred using a Japanese shou sugi ban technique that creates a textured longevity. “This material is new to Montreal,” says Safonova, adding that it’s fireproof, insect- and rot-resistant and biodegradable. On the elevations facing the courtyard and the adjoining volumes, the design team opted for a wall composition with exterior insulation and fibreboard, covered with textured acrylic panels. The panels can easily be removed for repair, and recycled at the end of their life. At ground level, the architects incorporated a mesh for durability. “There, it made the panels as durable as brick, so you can bump into them hard with bikes or carts without causing damage,” explains Safonova. “We like to imagine the project as a fruit,” says Safonova. “There’s the exo-carp—the hard, exterior shell or thick peel—then there’s the meso-carp facing the interior courtyard and enclosing the juicy and fragile interiors.” Whatever the image, the project is the sweet fruition of planting the seed for a new typology. Susan Nerberg is a writer and editor based in Montreal.